Deep in the rain forests of Grenada, anarchist chocolatier Mott Green seeks solutions to the problems of a ravaged global chocolate industry. Solar power, employee shareholding, and small-scale antique equipment turn out delicious chocolate in the hamlet of Hermitage, Grenada. Finding hope in an industry entrenched in enslaved child labor, irresponsible corporate greed, and tasteless, synthetic products, Nothing like Chocolate reveals the compelling story of the relentless Mott Green, founder of the Grenada Chocolate Company. Relocating from Oregon to Grenada in 1998, headstrong and driven, Mott Green set out to make chocolate, from the tree to the bar, using recycled antique equipment. 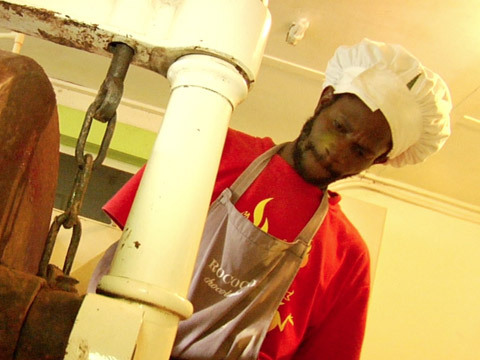 Wondering, “Would we really learn how to make great chocolate?” the neophyte entrepreneur leased one hundred acres of land from a neighboring estate and established the Grenada Organic Chocolate Cooperative. Within five years, the cooperative was producing nine to ten tons of local organic chocolate. Nothing Like Chocolate looks at this revolutionary experiment, focusing on how solar power, appropriate technology and activism merge to create a business whose values are fairness, community, sustainability and high quality. While Hershey’s threatens to remove cocoa from chocolate, and can not guarantee slave-free cocoa in its chocolate, it is Mott Green and his friends, including calypso singer and lawyer Akima Paul, and Shadelle Nayack Compton, owner of the Belmont Estate, who defy all odds. They insist that this worker cooperative is the model for the future: “We’re doing this for idealistic reasons: We are activists, and our goal is to create a true worker-owned co-operative." Kum-Kum Bhavnani is university professor by day and filmmaker by night. She has lived in California for the last two decades, via India and London. Her first documentary, The Shape of Water, narrated by Susan Sarandon, screened around the world in 2006, including Istanbul, Rome, Barcelona, London, Toronto, Trinidad, San Francisco, Washington, D.C., and at FESPACO and the 2008 Middle East International Film Festival. On its travels, Shape garnered a number of awards such as Best Documentary (Miami Women’s International Film Festival, Reel Sisters of the Diaspora and Queen’s International Film Festival), the World Cinema Award (DC Independent Film Festival), and Best Director (San Francisco Women’s Film Festival), as well as two HUGO awards.